Vegetables thrive in sunshine. Only green leafy vegetables can best be grown under various levels of shade though it will alter their growth and flavour so a gardener has to decide if this is beneficial. Consideration of roots and sunshine are crucial in the planning stage. Climate we are stuck with unless we move. For instance the level of frost. All other issues can be worked on to some degree. This can be designated the easiest thing to change given a little time. Air introduced after each crop is beneficial. As rotary hoes create a hard pan where blades bottom out and disrupt soil life and cause compaction, they are not recommended. With a tractor curly tynes are best. When aerating by hand a garden fork is ideal with soil not turned over. A broad-fork can speed up the process with a little effort. Make your own adding everything which is desired to be added into the heap. Cultivate in a green manure and let the soil life turn the organic matter into humus. The green manure is a good soil preparation and weed control. Most gardeners know how beneficial are earth worm castings. So earthworms can be encouraged in the garden. They eat only dead organic matter and castings are humus. So always think of the earthworm when aerating the soil, digging in green manure, watering and mulching the surface. Chemicals are not beneficial to earthworms. Anything done to aid earthworm will also be beneficial to soil life and the health of your garden soil. When a gardener experiences failures with pests, action can be taken. There is now available white netting or shade cloth which only casts 10% shade. This is designed to keep out insects as small as fruit fly and certainly cabbage moths. Wood-ducks will eat young sprouts and seedlings so the netting will keep them out too. 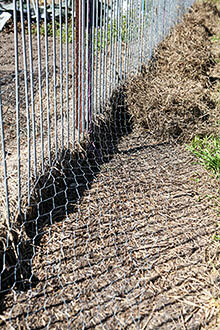 Animals such as wallabys, kangaroos, bandicoots and poultry can also be kept out with a wire fence or old pool fence as illustrated. Rodents however need further responses. Few gardeners realise how mice can dig up seed without being noticed. They can smell each seed out and their digging of a freshly cultivated soil can go unnoticed. When the plot is watered next day all evidence is gone. Favourite mice feed includes corn, melons, cucumber, squash and pumpkin seed. A good decoy is to place seed near but away from the plot to feed rodents without them needing to dig up the garden plot. Replace seed every evening as birds can take seed during the day. In areas of limited water drip lines are very useful. 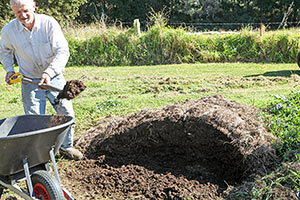 Water can get through mulch and deep into the soil Gardeners can set a timer on the hose or come back some time later. This can be done by planting direct and running covers over seedlings. Raising seedlings in a green house or igloo then transplanting is a common method of getting many weeks starting time on the season. Whilst seedlings are growing the garden can be prepared and weeks old seedlings planted into a weed free plot once soil has warmed up satisfactorily.